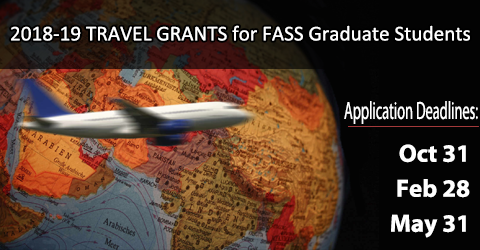 Sabancı University, Faculty of Arts and Social Sciences is pleased to announce that a limited number of Conference Travel Grants will be available for FASS graduate students for the 2018-2019 academic year. The Faculty of Arts and Social Sciences will support the professional development of graduate students by providing a limited number of competitive Conference Travel Grants to both master's and doctoral students in good academic standing. The Conference Travel Grants provide full or partial support for travel and related costs (lodging and registration fees) for the international meetings or conferences in the applicant's field of specialization. Students who have received an official invitation to participate in a conference and presenting a paper are eligible to apply for grants. Only one conference travel grant will be awarded per year. Support is provided only for travel to professional conferences; other forms of travel cannot be supported under this program. The number of awards will depend on the availability of funds. All expenses must be supported by ORIGINAL receipts taken for Sabancı University name. Applicants are required to seek additional funding from appropriate sources. The applications should be submitted to the FASS Dean's Office by 5 p.m. on one of the following dates: October 31, 2018, February 28, 2019, and May 31, 2019. Some official notice of the conference (e.g., the URL of the conference website) and official evidence that the applicant has been invited to participate (e.g., a letter of invitation or a page from a website that includes the student's name as a participant). A brief statement, no longer than one page, explaining the student's academic interest in attending the conference. An outline of the student's travel plans and a travel budget (plane/train/bus costs, logging expenses and registration fees). One letter of recommendation from a faculty member, preferably the student's thesis advisor. This letter should be no longer than one page and should explain the academic relevance of the conference to the student's degree objective. Completed applications received by each deadline will be reviewed by a committee. Awards will be announced approximately 4 weeks after the application deadline. During each award cycle, approximately one-third of the total funds will be available for award. After each deadline, the committee will rank applications on the basis of perceived academic merit and the strength of the faculty letter of recommendation.